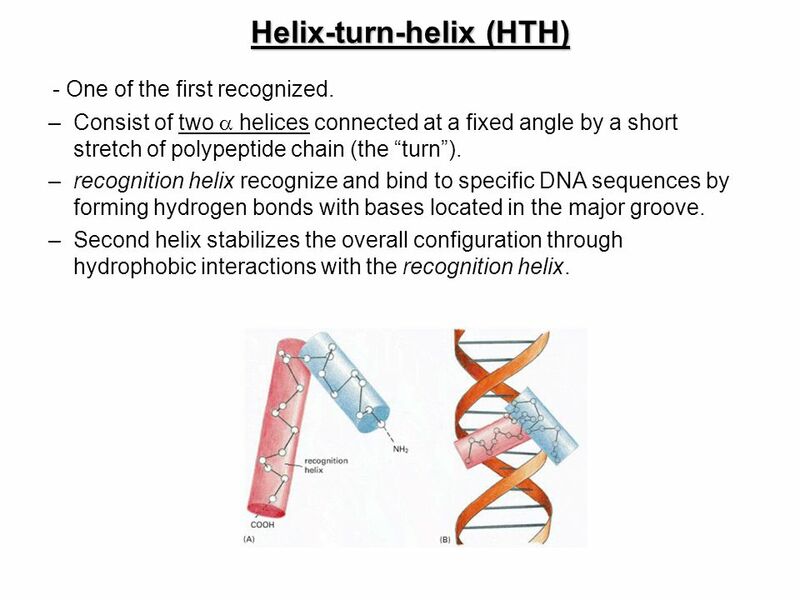 This slide states that the second helix works to stablize the configuration of the two helixes via hydrophobic interactions. What exactly is this hydrophobic interaction? In other words, what molecular interaction does the second helix have with the recognition helix? To quote Sir Max Perutz, in general, the insides of proteins tend to be "waxy", while the outsides of soluble proteins tend to be "soapy." Those two alpha helices are interacting in a space that is energetically unfavourable for a polar solvent, like water. Since the outside of the DNA double helix tends to be highly charged, and the edges of the stacked base pairs also have H-bond acceptors and donors, the portion of the alpha helix that interacts with the DNA sequence, will also contain charged amino acid side chains. In contrast, the portion of the alpha helix that faces inwards, towards the interior of the protein, will have largely non-polar side chains. Not the answer you're looking for? Browse other questions tagged molecular-biology dna protein-interaction or ask your own question. Why do the major and minor groove exist in DNA? At what point, when connected, do DNA strands become a helix? What are the interactions between mtDNA and nucelus' DNA?